This post covers the remaining two weeks of second quarter as well as winter break. 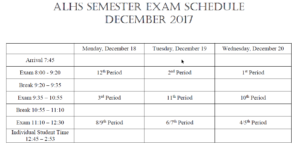 Exams: The exam schedule is below. Our exam will cover all learning goals from units one through three. Your study guide is your learning goal packets. We will take our exam during our regular class period and not during our lab periods. All school policies regarding exam procedures apply. Please be sure to bring a working calculator and a number two pencil. Click to enlarge, sisters and brothers! First period: On 12/11 you will take notes on podcast 6 in class because there will be a sub. Assignment 6 will be due for homework on Tuesday. (It’s six questions, so chill. 🙂 ) On 12/12 we’ll go over all of this, do goal set 6, and will do a lab activity (no lab report.) 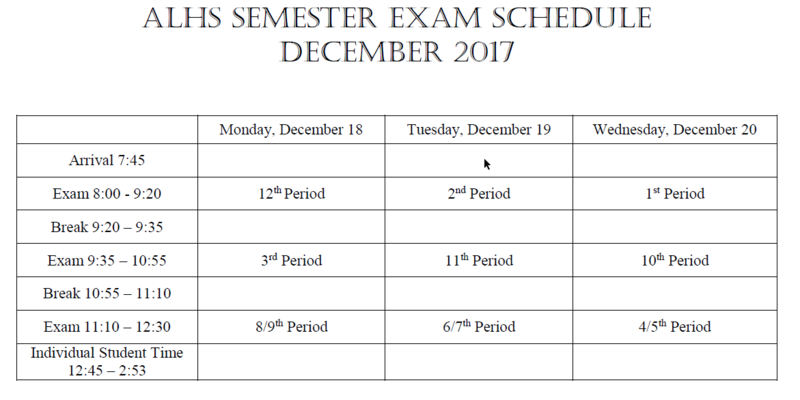 On 12/12 we’ll take the unit test. That will leave us two days for exam review! That’s not like me, but you earned it with your efficiency! 🙂 Your physics homework over winter break is to relax, take care of yourself, and enjoy being with people you love! Third period: On 12/11 you’ll do assignment 5 and goal set 5 in class with the sub. For 12/12 take notes at home on podcast 6 and finish assignment 5 and goal set 5 if you didn’t finish in class on 12/11. On 12/13 we’ll take the goal set 5 quiz and do assignment 6, squeezing in goal set 6 when we can. Your test will be Thursday or Friday. We’ll also fit in a lab activity (no lab report.) Your physics homework over winter break is to relax, take care of yourself and enjoy being with people you love! Fourth/Fifth period: Oh, wait. I don’t have a class that period. Sixth/Seventh period: What’s wrong with me? I don’t have a class this period, either. I should probably eat lunch. Eighth/Ninth period: Assignment 5 is due on 12/11. We’ll go over this and will then do goal set 5 to get ready for a quiz on 12/12. For 12/12 please take notes on podcast 6. On 12/12 we’ll do assignment 6. Goal set 6 will be due for 12/13, and then we’ll do a little lab activity (no formal lab report.) Our unit test will be Thursday. You’ve also worked really efficiently, so we’ll be able to do a tiny bit of exam review on Friday. Come prepared with questions! Finally, your physics homework over winter break is to relax, take care of yourself and enjoy being with people you love! Eleventh period: For 12/11 goal set 5 is due. We’ll also take a quiz over this goal set on this day. Podcast 6 is also due for 12/11. We’ll go over this in class and do assignment 6 in class. Goal set 6 will be due for 12/12, and then we can do a little review for the test that we will take on 12/13. On 12/14 we’ll do a small lab activity (no formal lab report) and will actually have a tiny bit of time for exam review on Friday. Come prepared with questions! Finally, your physics homework over winter break is to relax, take care of yourself and enjoy being with people you love! Recently NASA’s Juno Mission provided us with AMAZING images of Jupiter’s surface unlike anything we’ve ever seen before. The high-def detail is just gorgeous. Check the pics out for yourself! Here’s just one! Look at the depth! The different colors come from different gases with different densities and concentrations, giving us the marbled appearance. 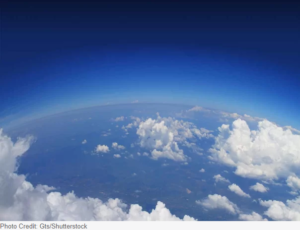 See how some of the gasses are more transparent? You can see deeper through some of them! Cool! PLUS look at how the storms can go either counterclockwise or clockwise… right next to each other! That doesn’t happen on Earth! You can ask me why in class! I’d be happy to geek out about it! Click image to enlrage, peeps! There are two weeks remaining before semester exams, which run December 18-20. Please begin to study if you haven’t done so already. Also be sure to stay on top of all second quarter assignments and check PowerSchool regularly. No missing assignments will be accepted after December 13. If you have not yet done so please be sure to take notes on PODCAST 4: Newton’s Laws of Motion – First Law (Inertia) by Monday. Also for Monday only 3rd period and 8/9 period will take a quiz over elastic force (goal set 3). (The other classes have already taken the quiz.) We will do assignment 4 in class on Monday and Tuesday and will take a quiz over inertia and static equilibrium (goal set 4) as announced. When announced please take notes on PODCAST 5: Newton’s Laws of Motion – Second Law. We will work through many relevant practice problems and will complete assignment 5. Next week expect to do the final podcast and assignment from unit 3, perform an informal experiment regarding Newton’s second law, and take the unit 3 test. LAB REPORTS: 1st period’s are due Tuesday, 11th period’s are due Wednesday, and 3rd and 8th/9th periods’ are due on Thursday. One hard copy is due per writing team at the start of the class period on the due date.The documents you will need are: Friction Lab, Lab Report Writing Guide, and Lab Report Rubric. Be sure to share your document with me at burgessm@alstudent.org and upload ONE copy of your document to TurnItIn.com by Thursday at 3:00. The Earth is round, Kyrie. Don’t believe it? Here are easy tests you can do right here in Avon Lake to confirm it for yourself.